Weatherzone’s atmospheric modelling team configure, run and deploy high resolution atmospheric and wave models anywhere in the world. Combined with critical inputs from our team of meteorologists and delivered through the Opticast(TM) system, this means that you receive an unprecedented level of accuracy and precision for all of your forecasting needs, tuned to any location that you require. Improve operational planning and management through enhanced accuracy of weather forecast information. Accurate high resolution NWP is essential to allow OpticastTM to resolve to the greatest extent possible the local-scale meteorology crucial to detecting micro scale features such as sea breezes, circulation within convective cells, plus topographic and surface roughness effects. The model used is the Weather Research and Forecasting system (WRF), developed by the National Oceanic and Atmospheric Administration (NOAA) National Centers for Environmental Prediction (NCEP). WRF is designed to be a flexible, state-of-the-art atmospheric simulation system that is portable and efficient on available parallel computing platforms. It is suitable for use in a broad range of applications across scales ranging from meters to thousands of kilometres. 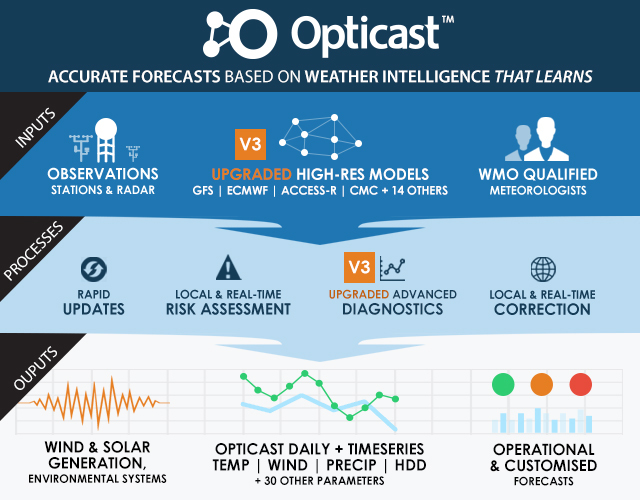 Verification shows that OpticastTM consistently outperforms any single model forecasts. The high resolution of these forecasts allow the user to see the likely “shape” of the temperature/wind curve throughout any given day. This information is key to dealing with common micro-scale features such as sea-breezes, cool changes, early or late maximums and developing rainfall events. The rapid update schedule minimises short-term divergence between forecast and actual conditions, which means that the forecast is never out of date, and is especially powerful in rapidly changing conditions. Using proprietary algorithms and Artificial Intelligence, the system is able to learns the local conditions and adjusts forecasts accordingly. Not only is OpticastTM the most accurate system available, it is now one of the most relevant, with almost half a million forecast points available across Australia. OpticastTM has proven itself to be a world class forecast system, which has just got better.